We were searching for a dinghy to use on our up coming North Channel trip this summer, but couldn't find one small enough to stow. 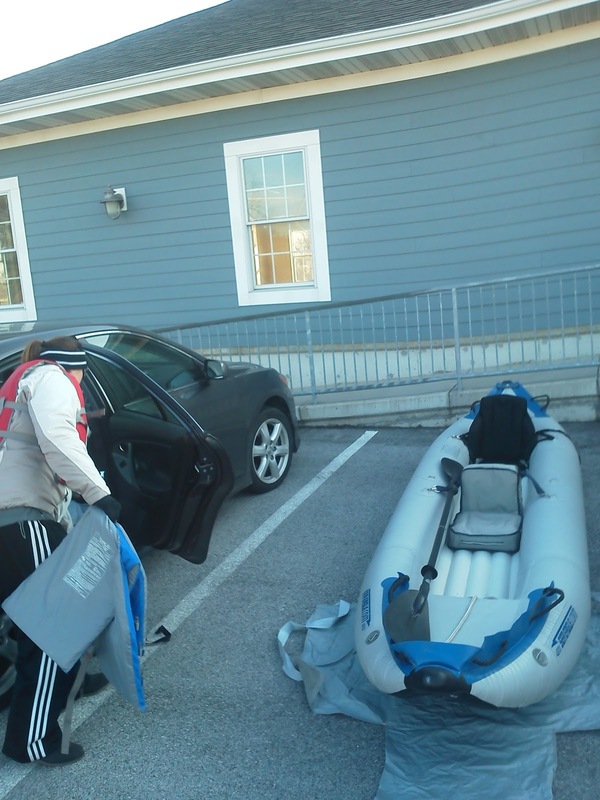 Our boat just doesn't have the room to comfortably stow a dinghy, gas can, and outboard motor so we needed something we could paddle easily, be rugged, and be able to inflate/deflate quickly. 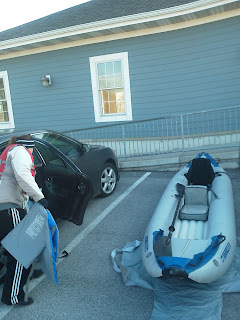 We decided on a Sea Eagle 420 Explorer inflatable kayak and, as luck would have it, found one posted locally on Craigslist at 1/3 the price of new! It inflates in less than 10 minutes, fits in a custom carrying bag, and has a 900 lb capacity! Unloaded and inflated in just a few minutes! 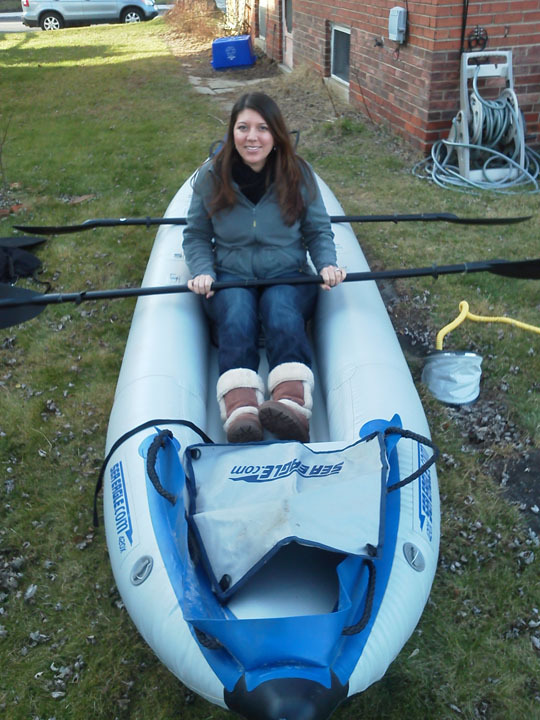 It may be January and the water only 35 degrees, but we couldn't wait til spring to sea-trial our new inflatable kayak. We stopped at two lakes prior to the marina to test our new toy only to find they were frozen! The marina has a switching current that keeps it from freezing a little later than other bodies of water. 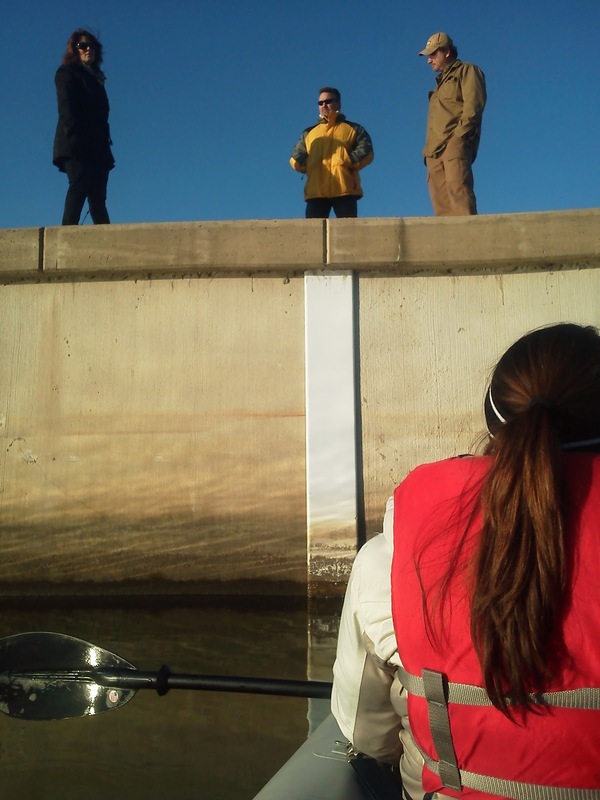 While paddling around our marina we saw our friends from D dock Ron and Kelly, as well as Greg from B dock! This really came as no surprise to us considering we often take walks throughout the winter at the marina. I guess we do whatever we can to fight off this depressing time in a boater's life called winter. The kayak tracks straight, paddles with ease, and feels unbelievably stable. We look forward to many hours of enjoyment from our Lil' Pickle. Hey we recognize that picture! !